Penguin poo (guano) stains, visible from space, have helped British scientists locate emperor penguin breeding colonies in Antarctica. Knowing their location provides a baseline for monitoring their response to environmental change. In a new study, published this week in the journal Global Ecology and Biogeography, scientists from British Antarctic Survey, (BAS) describe how they used satellite images to survey the sea-ice around 90% of Antarctica’s coast to search for emperor penguin colonies. The survey identified a total of 38. Ten of those were new. Of the previously known colonies six had re-located and six were not found. Because emperor penguins breed on sea-ice during the Antarctic winter little is known about their colonies. Reddish brown patches of guano on the ice, visible in satellite images, provide a reliable indication of their location. Emperor penguins spend a large part of their lives at sea. During the Antarctic winter when temperatures drop to −50°C they return to their colonies to breed on sea-ice, but this is a time when it is most difficult for scientists to monitor them. This research builds on work by French scientists who extensively studied one colony and found the population was at significant risk from climate change. The six colonies not found in this study were at a similar latitude suggesting that emperor penguins may be at risk all around Antarctica. Previous knowledge on the number and distribution of emperor penguin colonies was poor, due to their habit of breeding on sea-ice during the Antarctic winter. These areas are infrequently visited during the Antarctic summer when researchers can access them although the penguins are away feeding at sea. 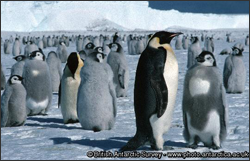 Estimates of the total number of emperor penguins range between 200,000 – 400,000 pairs. Of the 38 colonies located on the continent in this study, 10 are new, six have been re-positioned and six that were previously thought to exist were not found or have disappeared. These six colonies were originally recorded north of 70° South which helps substantiate other modeling studies and suggests that emperor penguins around Antarctica are at significant risk from climate change. Few colonies are monitored on an annual basis. This study concentrates on the number and location of emperor penguin colonies; other techniques are necessary to provide accurate counts within these colonies. The next stage of this research will be to use high resolution satellite data to count up the penguins at each of the 38 colonies. Recent computer modeling studies (Jenouvrier et al 2009, published in the Proceedings of the National Academy of Sciences), based on over 40 years of population data from a long term study colony of emperor penguins in Terre Adélie in the Antarctic, have predicted that populations have a high probability of declining by 95% or more in the face of climate change. These predictions are based on one colony that is located relatively far north at 66.6° South. The new methods developed in the study by Fretwell and Trathan make it possible to test these predictions at other locations where emperor penguins breed, particularly further South where the majority of emperor penguin colonies occur. The emperor is the giant of the penguin world and one of the largest of all birds. Gold patches on their ears and on the top of their chest brighten up their black heads. Emperors are the only penguin species to breed through the Antarctic winter. The emperor penguins breed the furthest south of any penguin species, forming large colonies on the sea-ice. So that the chicks can fledge in the late spring and early summer seasons, emperors breed during the cold, dark winter, with temperatures as low at −50°C and winds of up to 200 km per hour. The female lays a single egg in May then passes it over to her mate to incubate whilst she goes to sea to feed. For nine weeks the male fasts, losing up to 45% of his body weight. The male balances the egg on his feet, which are then covered by a thick roll of skin and feathers. The egg can be 70°C warmer than the outside temperature. To achieve this amazing preservation of heat, emperors have a special combination of adaptations, with a dense double layer of feathers and a large fat reserve. When the female arrives back in August, just around the time when the chicks are due to hatch, she takes over brooding and feeding the chick whilst the male treks up to 100 km over the ice to find food. Afterwards, both adults rear the chick.